Most nineteenth-century organ compositions either had abstract titles – voluntary, fugue, sonata, prelude, postlude and so on – or took their names from their Italian tempo marking – Andante (in G), Allegretto (in F) etc. From about 1850 onwards, English composers started to use hymn-tunes in their organ works as thematic material as Mendelssohn had done in his sonatas published in 1845. The idea of using ancient melodies in this way reflected one of the traits of early romanticism – looking to the past for inspiration, the past being seen to represent the natural order of things. A dedicated anglophile and frequent guest of Queen Victoria and Prince Albert, Mendelssohn was a dominant influence on the Victorian musical scene. An arrangement for organ of his Overture to the Oratorio ‘St Paul’ (premièred in Düsseldorf in 1836 ten years before Elijah in Birmingham) was included in volume No 42 of W T Best’s hundred-volume series of transcriptions for Novello which he produced between 1850 and 1872. Neither Wesley nor Smart pursued technical accomplishment on the organ in a systematic way, as Best did. Being slightly younger, he had the advantage in his formative years of an instrument to practice on, at Pembroke Road Baptist Chapel in Liverpool, boasting the new ‘German’ compass pedal-board that was by then in vogue. Before the 1840s most English organs had no pedal-board, or a rudimentary one, or one which had a non-standard compass. By the date of the Great Exhibition in 1851 Best had become the undisputed champion of the modern organ, and in 1855 he was appointed to the prestigious post of organist at St George’s Hall in Liverpool. Mendelssohn’s cleverly constructed overture, with its prominent use of the chorale Wachet auf, is an ideal vehicle for Best to show off the capabilities of the modern instrument. 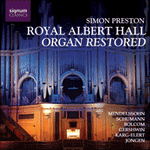 When the organ of the Royal Albert Hall was completed in 1891, there was no question who would be invited to give the opening recital: it had to be W.T. Best. 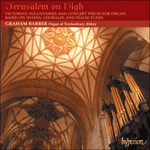 Best was the greatest British organist of the Victorian age, and he had recently returned from Australia, where he had inaugurated the new organ in Sydney Town Hall. He lived in Liverpool, where he was Organist of St George’s Hall, and he played two recitals there every week for 40 years. His virtuosity was formidable, and his repertoire was reputed to comprise some 5000 pieces, including “everything worth playing that had ever been written for the organ, and everything in classical music that could suitably be arranged for it”. Mendelssohn was the musical idol of Victorian England, and his works provided a rich source of material for Best’s transcriptions. Rarely heard these days, St Paul was the first of his two big oratorios; it was first performed in Düsseldorf in 1836 and then in Birmingham in 1837. The orchestral Overture is a fantasia on the chorale Sleepers wake (Wachet auf), and in Best’s superb arrangement it makes a thoroughly convincing organ piece. The opening verse of the hymn is followed by a fugue, and the two themes are finally superimposed in a majestic peroration—a formula that would later be developed on a much grander scale in the chorale fantasias of Max Reger.